As a general rule, nothing good happens in elevator shafts. Elevators themselves are fine, sure, but the shafts themselves? I’m struggling to think of any way to interact with them that couldn’t result in fatal injury. This video is just the exception that proves the rule. Created by Russian art group Volna, Neubau is an audiovisual work that consists of PVC projection screens suspended in a fifty feet deep elevator shaft. 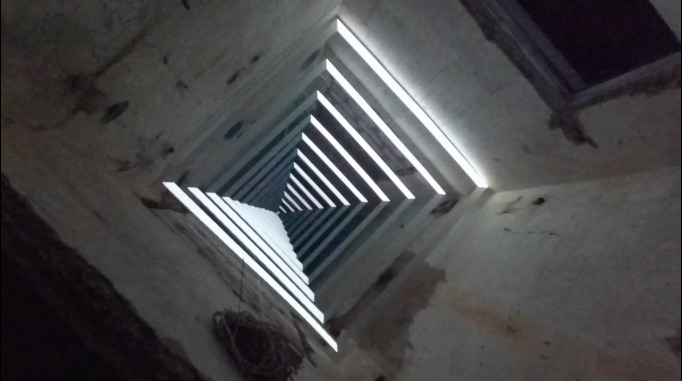 The geometric light patterns and accompanying drone-like soundtrack make this piece just as eerie as elevator shaft art should be. You can check it out—from a safe distance–above.